There’s no reason to recreate the wheel – or text or dimension styles, if you have them elsewhere. The easiest way to import a text or dimension style from another drawing is to use the DesignCenter. Go to the View tab, Palettes, DesignCenter or type designcenter on the command line. 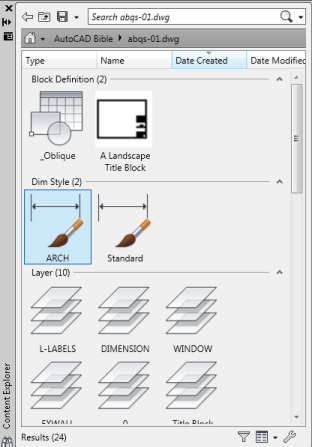 From the Folder list (it looks a lot like Windows Explorer) navigate to the folder, then the drawing that has the text or dimension style that you need. Click the drawing’s Plus sign to expand it and choose the type of elements that you want to import, such as a text style. On the right, you’ll see a list of the text styles that are available in the drawing. Drag the one you want onto the drawing area. Click the Plug-Ins tab, then click Explore. If the folder where the drawing you is not listed, click Add Watched Folder at the bottom. Navigate to the folder, select it, and click OK. AutoCAD scans the drawings in the folder; this process may take some time. The Content Explorer works best when you plan in advance. If you know the name of the element, enter it in the Search box at the top of the Content Explorer. If you know the location and name of the drawing, double-click the folder and navigate to the drawing. Double-click the drawing to display its elements. When you see the element you want, such as a text style, drag it onto the drawing area to import it into your drawing. Do you have any tips for importing text or dimension styles? Leave a comment! I interested with second method. Which version you used? How to open plug-ins? It really work. I like method 1. Thank you. Thank you! It works very well for me. This web blog has been a great help since I am picking up AutoCAD again after abandoning it for a few years. Thanks… It really gone very helpfull to me…. Great Tips!! I also use the STEAL plug-in off of the App Exchange…you can grab a multitude of items, styles, blocks, etc from another drawing. That’s all find and dandy, but how do I get it to ‘redefine only’ or ‘insert and redefine’ in the same way as can be done for blocks??! It can’t possibly be that I need to manually go in and update my dimstyles, my leader styles, etc…? Tools -> CAD Standards -> Check. 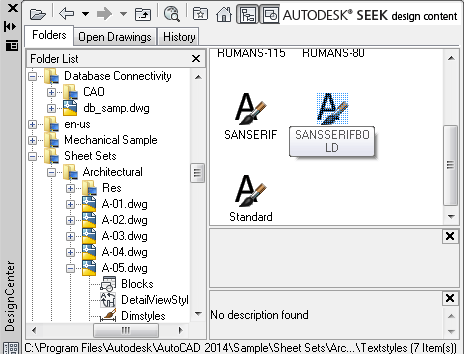 For Standard-file use dwg file (file -> save as -> *.dws) that contain all your right defined styles. Maybe I missed something, but when I do a search inside AutoCAD for this, I don’t find an easy solution/answer to this task. (Actually I didn’t, that’s why I’m here!. But it should be easy!!!!!!! Come-on Autodesk! Thanks for this and many other tips. They help ma a lot. Nothing new, but could be beneficial to someone: drawing template (DWT) is a good practice to manage design with proper text, dimension styles etc. DesignCentre not a recognised command in ACAD 2016 onwards.